Well, finally, my bag swap fabric arrived! It’s great (see below for a posted photo and no peeking andreamarie!) and well worth the wait! After studying it, I’ve definately decided to use the Rebecca Bag style from the Carry With Style book. I can’t wait to get this project started! I also recieved my Jalie 2320, jean jacket pattern that I had purched from a classified on Pattern Review. I know that it’s going to be 105 outside today, but I can’t wait to start sewing for fall! As for the lining of the bag, I chose a print that looks like ocean waves – it’s a bit darker in color (more dark navys) than the muscle man fabric, but I think that it ties it all together. I hope my partner likes it when I’m finished. 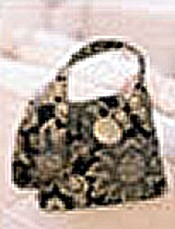 This entry was posted in Bag Contest 2006, General on July 17, 2006 by stacy. Oh how great is that fabric! No wonder you had to wait for it. Cute fabric. I can’t wait to see your jean jacket. I have been seriously thinking of making a jean jacket too. I just have been trying to decide between the Jalie or Kwik Sew jean jacket.